Paul Hart, Sensei has studied traditional Okinawa Karate for over 32 years. Hart Sensei founded the Matsumura Shorin Ryu Karate Hozon Kai in 1992. Mr.Hart is believed to be the last student of Hanashiro Shinyei, Sensei of Okinawa and is a credit to the system. 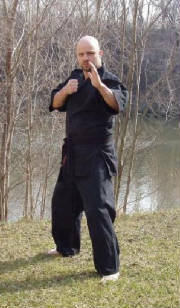 He has had the opportunity to study with and train with many other great Martial Arts Masters. He has in his Professional carrer recieved many real life merrits for his self-less service to the Martial Arts. He lives the Martial Arts Way. He also has training in Jujutsu and Kobudo. Paul Hart Sensei is the Chief Instructor of Karate Incorporated FortMyers,FL. Hart Sensei and Martin Sensei formed Karate Incorporated in 2004 to bring the best Karate possible to the public. Mr. Hart and Mr. Martin also formed an alliance in 2004 in an effort to bring the branches of Okinawa Shorin Ryu together to stregthen the tree .Paul Hart, Sensei has been working together with Al Martin, Sensei ever-since and they have made many new friends in a short time; they both still love learning and teaching Karate. Hart, Sensei has stated many times that he is a life long student.